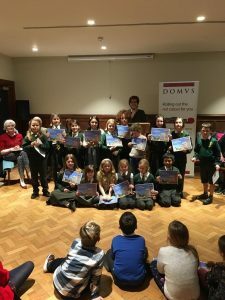 ‘Story House: The DOMVS Children’s Writing Prize in Association with Dorchester Literary Festival’ returned for its third year with rousing success. The competition was devised to inspire creativity, imagination and passion for the written word and, this year, received entries from talented young writers from Dorchester and surrounding areas. The stories were judged in two rounds; the first by Janet Gleeson and Paul Atterbury of Dorchester Literary Festival, along with Sharon Kirkpatrick of Dorset Library Service. The shortlisted stories were then judged by Polly Greenway, Director of DOMVS; Waterstone’s Children’s Book Prize winner David Solomons; Lady Emma Fellowes and best-selling novelist, screenwriter, actor and director, Lord Julian Fellowes. 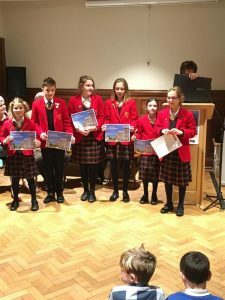 Niamh Bradley, a pupil at St Mary’s Catholic First School and Gabriel O’Donnell of Sunninghill Prep, were awarded ‘Highly Commended’ for their stories, which were read by Polly Greenway and David Solomons. Second prize went to Sam Diffey of Milborne St Andrew School, whose story was read by Lady Fellowes. 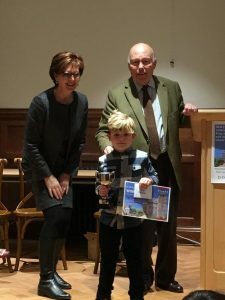 This year’s first prize went to Theo Porter from Milborne St Andrew School, who had his winning story read by Lord Fellowes. The event was enjoyed by all the children who took part and their families, and the celebration of young, Dorset talent inspired a sense of community in all present. The children stared up at the tower, then looked up at the open door. The three boys stepped inside, and the door slammed behind them. They screamed “AAAAAHHHHH” and rattled the door handle. It was no use. Tom said, “We are here we should make the most of it.” “Your right” said Sam “let’s explore”. There were spiders and cobwebs everywhere. Jake said, “I don’t like this, lets try the door again”. This time it worked but when they went outside it was a whole new world. They saw some children and walked down a hill to them. Tom slipped and the football in his bag fell out. A person from the new world said, “What’s that?” “It’s a football” said Sam, “this is what you do with it!” and started to kick the ball. Soon everybody joined in and the three boys made some goals and taught them how to play football. It started to get dark and the people from the other world ran home quick as dash. The three boys looked at each other. “How do we get home?” said Jake. Tom said “Let’s go back to the tower, come on” but when the ran up the hill it was gone. Then Jake said, “There is a hole lets see what it is.” They looked at it a bit scared and Tom said “It is a slide” so they went down it. It was colourful going down the slide, there were lights around them as they slid down the tunnel. When they got to the end of the tunnel, they saw a rainbow and Sam said, “Look we’re home again”.